Phari Lapcha Peak (6017m) rises from yak pastures above the village in a uniform slope to the final summit pyramid which is an undistinguished snow and ice slope. The peak looked a little more interesting from Ongre and can been seen as a curved ridge, with the face above Pisang being the truncated southern end of the mountain. Lapcha peak is one of the popular trekking in peak Everest region. Height of Phari Lapcha peak is 6017m. Main attraction of Phari Lapcha peak is panoramic views of Himalayan peaks like Everest (8850), Nuptse (7879m), Lhotse (9501m), Makalu (8475m), Baruntse (7720m), and Ama Dablam (6856m) etc. Despite being, a popular trekking area Phari Lapcha has only recently become a popular venue after being added to the permitted trekking peaks list in 2002. Day 08:Trek from Gokyo to Gokyo RI (5340m) and return to Gokyo. Day 09:Trek from Gokyo to Phari Lapcha Base Camp. Day 11:Trek from Phari Lapcha Base Camp to Gokyo. Day 12:Trek from Gokyo to Machermo. Day 13:Trek from Machermo to Dole. Day 14:Trek from Dole to Namche Bazar. Day 15:Trek from Namche Bazar to Lukla. Day 16:Fly from Lukla to Kathmandu and transfer to hotel. Day 17:Fly out.Pink Mountain Treks and Expedition's representative will drop you at airport before Three hours of your flight schedule. Boudhanath stupa is one of the biggest Buddhist shrines in the world where we observe Buddhist monks in prayer in the monasteries. Pashipatinath temple is the most famous Hindu temple in Asia, located in the banks of Bagmati river where men are meditating, pilgrims are bathing and occasionally funeral pyres means dead body are burning/cremating on the ghats. Then come back to hotel and introduction meeting with your guide in the afternoon. You can ask any questions regard the trekking and climbing with your guide on this group meeting and the final preparations for the trip. Day 5Trek to Dole (4040m) This is six hours trekking to Dole, mostly uphill except the first 2 hours trekking trail to Sanasa. On the way trekking, you could see Thamserku, Kantega and Ama Dablam. Day 6Trek to Machhermo (4150m) This is a five hours trekking on steadily climb trailalong the side of the valley where the small and thorny bushes give way to scrub juniper as the altitude increases. The trail passes many summer settlements, which are used when yaks are taken to these pastures to graze in the summer months. While trekking up on the trail there are excellent views of Cho Oyu, Kantega and Thamserku peak. Day 7Trek to Gokyo (4750m) This is a short 4/5 hours waling to Gokyo Lake following scenic path mostly uphill. 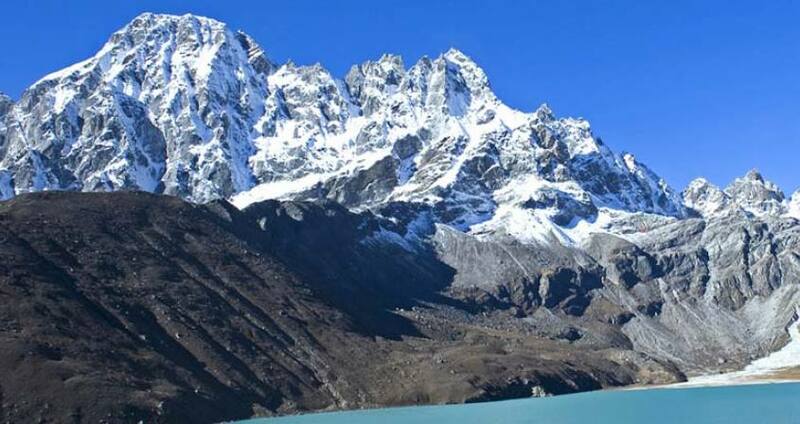 Gokyo Lake is known as Dudh pokhari, there is hotel settlement on the eastern shore of Gokyo Lake. The scenery is awesome with the reflection of Cho Oyu and Gyachung Kang on the emerald lake Gokyo. Day 8Trek from Gokyo to Gokyo RI (5340m) and return to Gokyo. Day 9Trek from Gokyo to Phari Lapcha Base Camp. Day 11Trek from Phari Lapcha Base Camp to Gokyo. Day 12Trek from Gokyo to Machermo. Day 13Trek from Machermo to Dole. Day 14Trek from Dole to Namche Bazar. Day 15Trek from Namche Bazar to Lukla. Day 16Fly from Lukla to Kathmandu and transfer to hotel.You can extend your trip in Nepal to explore the Jungle safari in Chitwan National park or Buddhist Pilgrimage trip to Lumbini, Birthland of Buddha or other part of Nepal's Trip or Can take your Flight to your destination. Day 17Fly out.Pink Mountain Treks and Expedition's representative will drop you at airport before Three hours of your flight schedule.